Description: NS 9620 pullin up on side track to wait for North bound empty coal train. Description: Westbound at CP MO with 4 different paint schemes. Description: 213 rockets over the Raritan River Bridge into Manville with an elephant style engine consist with a GE and an EMD. Description: NS TOFC train 213 that originates in Croxton each Saturday here speeds west across the Raritan River Bridge into Manville led by 2 "black beauties" on a sunny afternoon. Description: Headed off the Black River Bridge was UP Train MASNL 05 with a NS Dash-9 leading the way. Description: Eastbound on track two with CP Dorf in the background. Description: 19G is the next train through the worksite as it passes at 1:13PM after being overtaken by 21M at CP-Tulp. While this particular angle has only been shot about 900 times, a nice standard cab EMD still looks pretty good regardless. Description: Three GE's are hard at work bringing the extra section of 36Q uphill through Emmaus at 11:44AM. Description: An eastbound Norfolk Southern coal train arrives in Altoona, Pennsylvania, behind Dash 9-40CW 9620 (with Dash 9-40C 8832 and SD80MAC 7211). 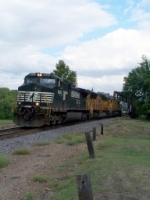 Description: NS intermodal train 225 races towards Memphis Tn. a few miles west of Sheffield, Al. at 16:30. Description: After a lull on the westslope I went back to Altoona where all the activity was unfolding. Here 21G is about to meet 20V at ALTO. Description: Stack train 20T races through the morning fog.